Imaris, Visualization, spots segmentation, surfaces segmentation, colocalization, spots tracking, Batch, plotting graphs with Vantage. This workflow detects spots from a 3D image by using straightforward set of ImageJ components. It receives the Laplacian Radius and the Threshold value s input. 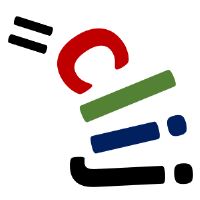 This workflow detects spots from a 2D image by using straightforward set of ImageJ components. It receives the Laplacian Radius and the Noise tolerance as input. 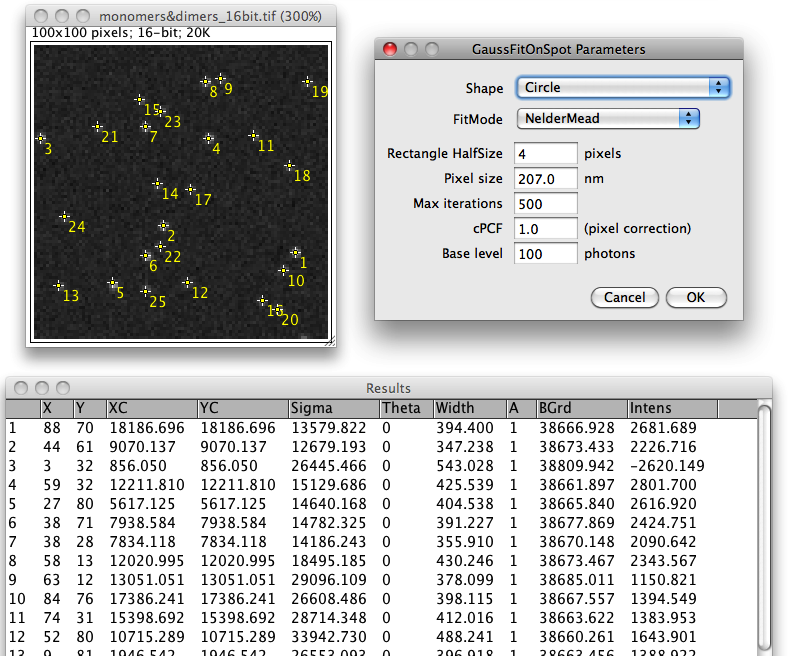 GaussFit_OnSpot is an ImageJ plugin for fitting Gaussian profiles onto selected positions in diffraction-limited images (e.g. single molecules, protein clusters, vesicles, or stars). The plugin performs a function fit in regions of interest (ROI) around spots marked by point selections in grayscale images. Single or multiple spots can be either selected manually with the Multi-point tool or automatically with the Find Maxima function. There is a PDF with more information, and also an example image. 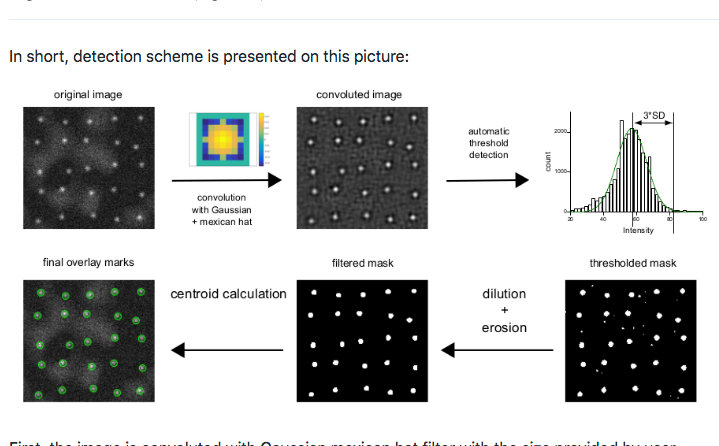 Quote " finding and/or analyzing colocalization of bright intensity spots (cells, particles, vesicles, comets, dots, etc) in images with heterogeneous background (microscopy, astronomy, engineering, etc). " Uses Gaussian-Mexican hat convolution for preprocessing.